Just to say that I agree entirely with him on his copyprotected CD issue. They are evil things forged by satan and blessed by some other religion's evil dude. By buying copyprotected CDs, you are actively encouraging the record labels to produce more of those pieces of crud. So don't buy them. In slightly different form than before (cinnamon icecream vs. vanilla icecream with real cinnamon mixed in), but still. Woo! 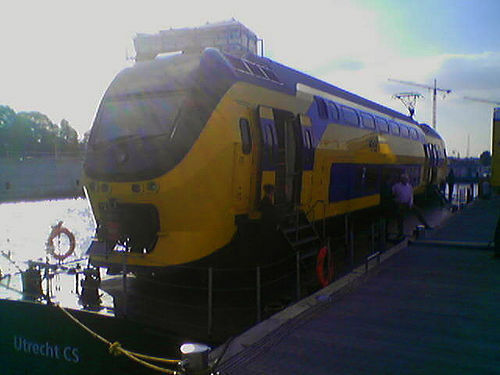 After the third train derailment at Amsterdam Central Station in two months, I was forced, yet again, to consider alternative ways of getting to Amsterdam. Today, I thought it would be fun to take the ferry from IJmuiden. All was smooth in the morning. The nice girl behind the counter even saved me 3 euros by reminding me that my Student's Public Transport card (OV-Studentenkaart) was valid there, too. This is a promotional thing from NS, to be used during SAIL '05. I knew it existed, though I hadn't seen it up close before. After getting on the boat (took some time, because there were too many people so I had to wait for the next one) we went on our way. About five minutes later, the captain asked all the people in the front part of the boat (12, including me) if we could please move to the back of the thing because it couldn't get the nose upwards (it was one of those flying boats, for lack of knowing the real name). It made some speed, got the nose up and we could all move back. People applauded. Some ten to fifteen minutes later, we cross a submarine. Didn't see that coming (snigger). Complete with 30-or-so marines waving at us. And about that waving-- what is it with boats and people on them? Damn near every boat we crossed or passed got waved at by the people with me. And it's not just that those people were imbiciles, the people on the other boats all returned the favour. I just found that really odd. I've been thinking lately about how my mail server should send me notifications of new mail, instead of having my client check every X minutes. I don't think it can be done with IMAP (and I'm positive it can't be done with POP) but after some tinkering I found a way: AppleScript. Back in the days of Classic MacOS, Apple was nice enough to introduce Remote Applescripting. This meant that you could execute an applescript on machine A, and it would do stuff with machine B. The problem was that this only worked with AppleTalk, so not over the internet. Then came MacOS 9, which added support for remote apple-events over TCP/IP. This allowed people to do their applescripting not only with machines on the local network, but also with machines half the world away. Great, I can use that. MacOS X added another nicety to it: it supported all this not only over IPv4, but also with the next generation of the Internet Protocol, IPv6. I happen to be IPv6-enabled, so that was of great use to me. It's simple, and it works. I'd use the keychain to store the password, except that doesn't work if you aren't logged in graphically. (Apple: fix that!). I saved this as a runnable application. You want to use RSA/DSA keys so it doesn't ask for a password to get in. You also want to add yourself to /etc/sudoers to avoid that password-prompt too. All that's left now is to instruct the mail server to execute that shell script whenever mail arrives. I did that by setting up a rule that matches anything except a certain mailing list. Yes, ssh also works fine over IPv6 and I could have set the shell script to ssh to my machine and locally run the applescript. I didn't because the xserve is more available (pretty much always) and I don't want the mail server to get stuck up on a shell script waiting to time out. Not that 'I want my MTV' stuff at the beginning, skip to where the drums kick in. Website powered by Zotonic, the Erlang CMS.